Within Timesheets you can edit, update, add, clear and delete times. Some functions can only be completed by Admin users or Managers depending on your settings. Some of these functions also can only be done once Shifts or Timesheets have been unlocked or unapproved. 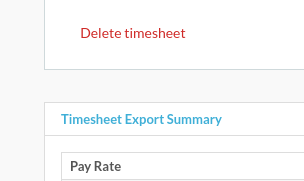 When you export your Timesheets to your Payroll system, they become locked in Tanda. You may find that after you have exported, you need to make a change. This may be due to an employee being incorrectly categorised or you needed to add in Leave or an Allowance. Admin, Payroll and General Manager users have access to unlock Timesheets. Team Managers will be able to status of the Timesheet but won't be able to unlock it, they will need to contact one of the levels above if they need to make a change. If you need to make a change to a Timesheet, once you've checked it's unlocked, you can then unapprove it. Once it's white, you can then make the changes you need to, and then click Approve again to change it back to Approved to export. You can then click Approve all once you've made your changes. Changes save automatically so you don't have to worry about approving the shift if you need to make other changes as well. In the example above, if I click on the C: 09:00, the box above will automatically populate with this time. 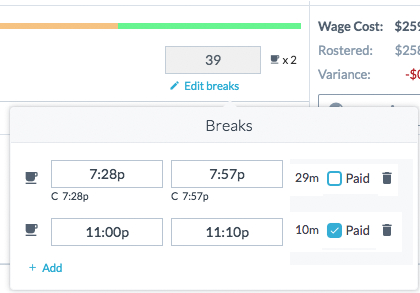 You can update the total break amount, start and end times of breaks, add or remove breaks, or mark a break as Paid. As you can see above, the employee clocked a 29 minute break and I have manually added another 10 minute break. If an employee forgot to clock a shift, the field will show as red to indicate it is incomplete. To fill in the missing time simply click into the field and start typing. You can also click the rostered time to automatically popular that field with the time you have clicked. You can clear times in a Timesheet or delete the whole Timesheet. Just keep in mind that once this is done it cannot be reversed. Deleting Timesheets is also only visible to Admin level users, not General or Team Managers.